This work was developed within a research project whose aim was to investigate the potential of Deskarte's 'Design Expert' software and Rapid Prototyping technologies to extend the creative practices of independent makers. The research was exploratory in nature where the software was not investigated as a tool for modeling preexisting designs, but as an active medium with which to experiment. 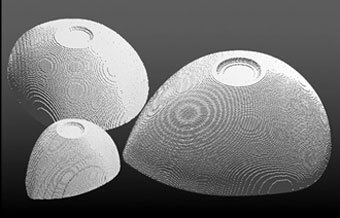 I was keen to locate the tools and facilities which were unique to this particular software package and facilitated the production of forms and surfaces which were created by the inherent nature of the software, rather than the rigid control of the user. This approach provided the opportunity for producing unexpected and original works which have their roots in the medium in which they are created (i.e. the computer modeling environment). The digital models produced using 'Design Expert' were manifested physically using LOM paper layer rapid prototyping technology. Silicon moulds where produced from these solid paper masters, and from these moulds silicon blocks where cast. 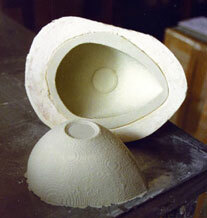 Slip casting moulds where then made using the blocks and the final pieces where slip cast in semi-porcelain. A fuller description of this project can found in: 'Computer Technology and creative Practice, Ceramic Technical No. 14, May 2002. 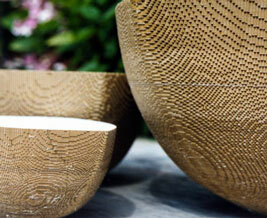 This work was produced within an AHRB funded research project carried out at Bath Spa University College.